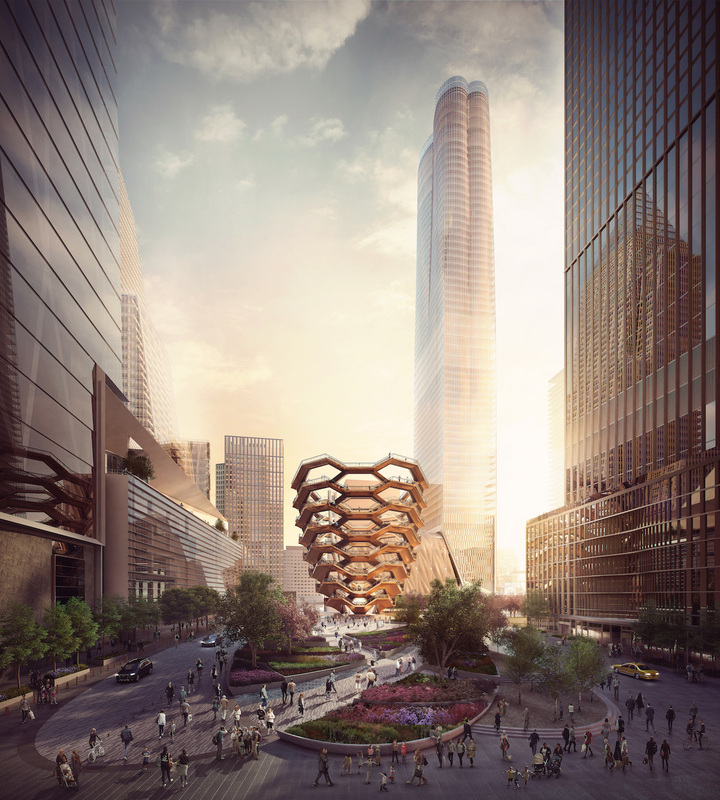 While the vertical element of Related’s Hudson Yards may be the site’s most prominent attribute, the creation of a public square at the ground-level will cement the mega-project’s iconic status, and new renderings from landscape architects Nelson Byrd Woltz reveal the latest plans. Nevertheless, the images give a glimpse of what the pedestrian experience will be like when traversing the Hudson Yards, and the thoughtfulness and interactivity of the site is impressive. 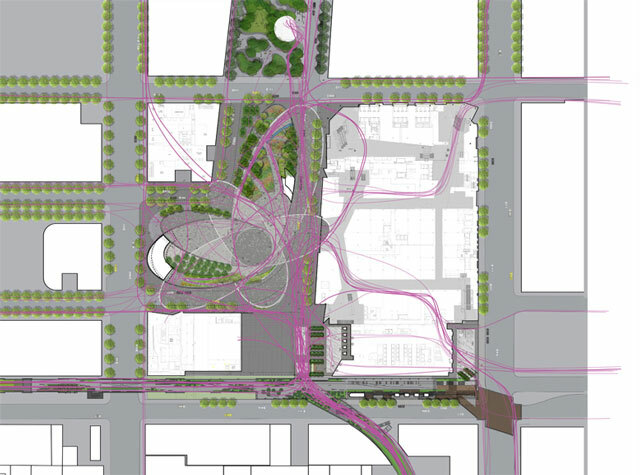 Per Nelson Byrd Woltz’ page on the project, “landscape design for Hudson Yards employs spectacle, fountains, art, and horticulture to set it apart from its neighbors,” and the description looks spot-0n; Thomas Heatherwick‘s mark on the park is also apparent, as flowing stairs — one of his trademarks — are incorporated into the plaza. Even with the admitted spectacle, the landscaping will help develop a context for the surrounding buildings, as the new neighborhood is literally sprouting from nothing. 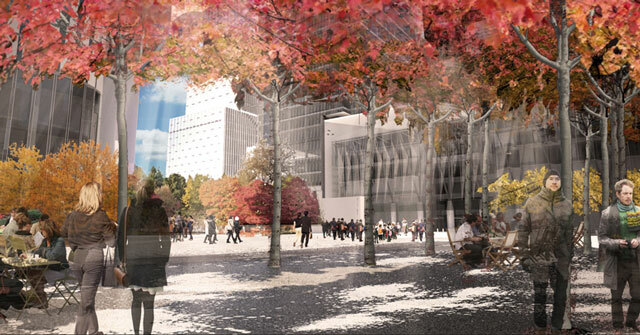 While the renderings do not offer a complete perspective, the most notable beneficiary of the park’s aesthetics appears to be the ‘Culture Shed’ at the base of the Diller Scofidio + Renfro-designed ‘D’ tower. 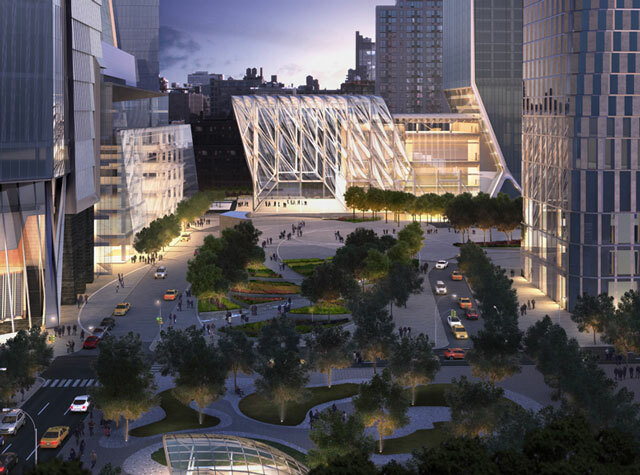 Besides providing a visual anchor to the pedestrian realm, integrating the Shed into the new park is important because it will be the only truly human-scaled structure of the Hudson Yards, providing a link between the ground-level plaza, The High Line, and the skyscrapers that will tower above. 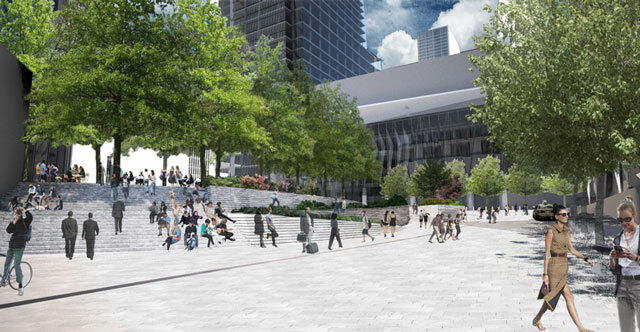 Work on the new plaza will begin shortly; the first office towers are already rising, and completion of the park should occur well before 2020.